Hyde Park, London © Travel Signposts..
Perhaps most famous for the Speakers’ Corner, where eccentrics, budding orators and other speakers stand on top of a soapbox and shout their views to the crowd, Hyde Park is one of the Royal Parks of London and certainly one of the largest parks in central London. But there’s much more to see and do in Hyde Park than just listening to political opinions and the heckling by the crowds in this Hyde Park Corner. The land forming the park was first acquired by Henry VIII from the monks of Westminster Abbey in 1536. While Henry used the park for deer hunting, the horseback riding today is strictly not for sport. Casual and relaxing, the trails are abundant but riders must bring their own horses. Visitors can often see the Royal Horse Artillery riding on horseback through the park early in the morning. First made accessible to the public by King James I in the early 17th century, the park is split by the Serpentine, a river dammed to make an artificial lake. The idea was originated by Queen Caroline, the wife of King George II, an avid gardener. Boat rides on the lake remain a popular activity. 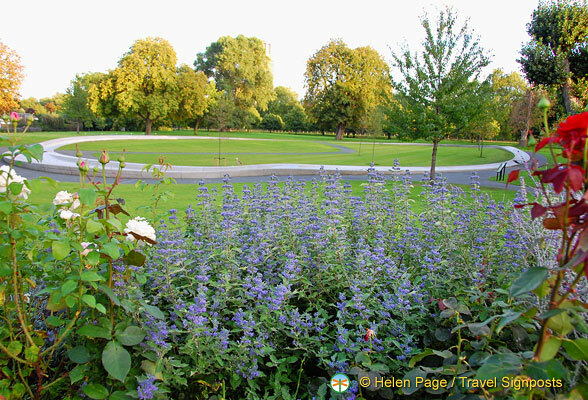 Hyde Park is perhaps the oldest park in London and its 350 acres of parkland (140 hectares) contain peaceful walks through gardens and woods, boats for hire, venues for music concerts and is very nearby several stellar pubs and restaurants. There’s even a pet cemetery and during the summer, Sunday concerts are held at the Bandstand. In the north east corner, at the end of Oxford Street is the famous Marble Arch. The structure was built as a gateway to Buckingham Palace but it was moved to the park in 1851. Several monuments located in the park are worth a look. The latest tribute is to the late Diana, Princess of Wales. The Diana, Princess of Wales Memorial Fountain is built from 545 pieces of Cornish granite. The water flows down to the calm pool in two directions and the nature of the water flow is intended to symbolize Princess Diana’s life. There are three bridges that cross the water over the centre of the fountain. Sports abound on the many fields, including tennis (6 courts, with a changing pavilion and cafe), a six rink flat bowling green and spontaneous soccer games. The Magenge at the end of the Sports Field offers a children’s playground to amuse the younger kids. Nearby the park is the Four Seasons Hotel Bar where visitors thirsty from the activity can cool off and get refreshed in a wonderful, upmarket environment. The Conservatory in Lanesborough offers a piano bar and great dining. For those interested in something a little more lively, there’s the Met Bar at the Metropolitan Hotel. Patronized by celebrities, it remains a popular venue. The Rose & Crown Pub in Mayfair is probably the rowdiest of the lot, for those who like their entertainment loud and crowded. Then, there’s the Colony Club for those who like to gamble, and (for service personnel) the Royal Air Force Club isn’t far away. For great dining, the Petrus at The Berkeley Hotel is unbeatable, having rightfully earned its Michelin Star. Hyde Park lies between Bayswater Road to the north and Knightsbridge to the south, with Park Lane to the east and Kensington Gardens to the west. The park is easily reached by the Tube (the London Underground subway system). There are many entrances to the park and which tube station you get off at depends very much on which direction you’re coming from. Search for Hyde Park hotels and read hotel reviews HERE. See more of our Hyde Park photos HERE.